View cart “Gnathia Ware Epichysis” has been added to your cart. Datation : 12th century A.D.
Category: Vessels. Tag: Large Bowl (Tell Minis Type). 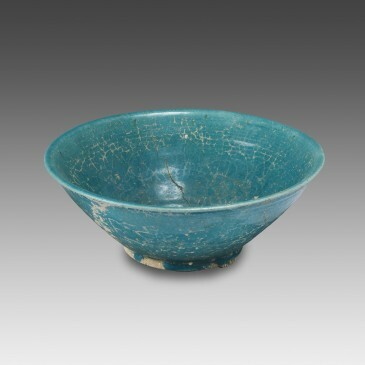 To the eyes of the modern viewer, this large bowl is outstanding for its aesthetic qualities resulting from the formal simplicity and the turquoise color. Perfectly turned, though slightly unbalanced in profile, the vessel is deep and wide. The straight wall terminates in a small horizontal rim with a rounded lip; the flat bottom is completed by a small disc-shaped base. 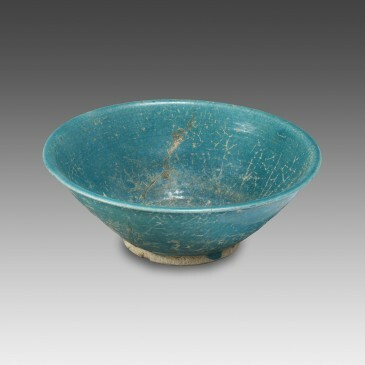 The decoration is limited to a thick layer of glaze that covers the entire surface, except for the bottom and the base. Before hardening during the firing process, the glaze accumulated more abundantly in the inner bottom of the vessel, while flowing irregularly on the outer surface, forming a sort of abstract line above the base. 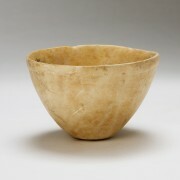 Considering its technique and shape, this vessel can be classified in the group of Tell Minis ceramics (from the name of a site in northern Syria, where the largest collection of ceramics of this type was discovered in 1959). Complete, in very good condition, but reassembled. Cracks in the glaze. 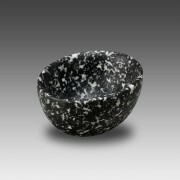 This vessel was carved from a granite pebble with black and white mottling. 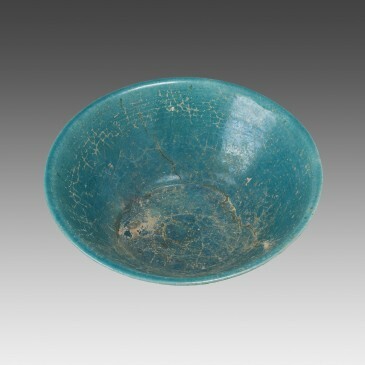 The elliptical shape of this miniature bowl is unusual and technically hard to achieve. A beautiful, small glass flask that imitates the shape of a date. 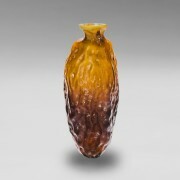 The vertical grooves recall in a very realistic way the wrinkles of the dried fruit. The vessel is complete and intact.